Today, we filed an amicus brief in the U.S. Supreme Court supporting two Texas laws requiring that abortions be performed only at certain types of facilities by physicians with hospital admission privileges. 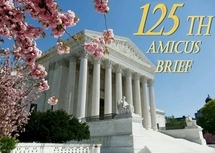 We set out why the pro-abortion petitioners, and the Obama Administration as amicus curiae, misrepresent to the Court its own abortion jurisprudence. However, even more importantly, our brief explains why Roe v. Wade was wrongly decided.